The difference between good art and great art is that great art challenges our perceptions, biases and assumptions of the world in order to drive a point home. This kind of art demands an artist who thinks outside the box and isn't afraid to place an often ugly mirror in society's face, even if that could possibly mean angering many people in the process. Sometimes, these artists aren't satisfied with merely pushing the boundaries of what's acceptable. In fact, the most controversial of these artists completely ignore all social constraints in their quest for truth. The more their art manages to shock, outrage and offend - the more controversy they incite - the better for their message. The pieces below are, in my opinion, ten of the most hotly debated works ever to have entered the art world. Should these works of art be removed and banned, or has everyone created a lot of fuss over nothing? I'd love to read your comments on whether or not you find them controversial - and why. If you're familiar with Myra Hindley (the woman who abducted, tortured, sexually abused and then buried fuve children alongside Ian Brady in what became known as the 'Moors murders') then you'll probably recognize the infamous black and white photograph of her face. At a first glance, Myra just appears to be a version of this photograph that has been blown up to a very large scale. However, it's only on closer inspection that you will see that it's actually not the same photograph at all - the image has been recreated using hundreds of children's hand prints. 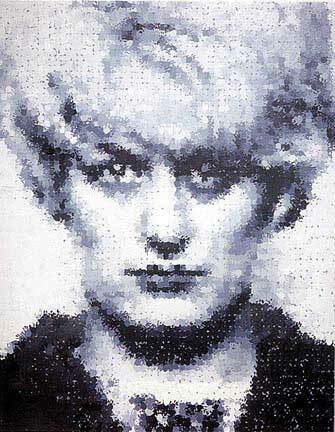 Bearing Myra Hindley's background in mind, it's easy to see why there was such a furore surrounding this painting. Not only was an art gallery displaying a huge image of one of the most hated women in England, but some argued that linking the woman and hundreds of children left a bad taste in the mouth. Even Myra herself wrote to the gallery and asked for the painting to be removed, out of consideration for the families of her own victims, as well as the families of any other children who had been killed. When a murderer - a woman not exactly known for her compassion - asks for such an image of herself to be removed, you know it has to be bad! In Eres Lo Que Lees (You Are What You Read), Guillermo Vargas has created one of the most controversial pieces in history - even I find it difficult to call this 'art'. 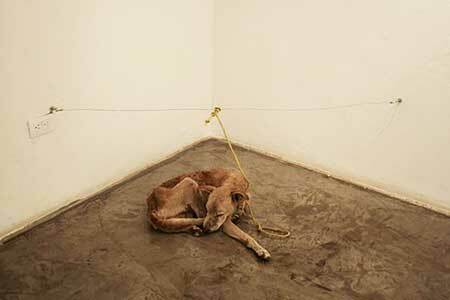 He chained an apparently underweight dog to the wall of the art gallery, with a bowl of food just out of its reach. It seems to be a horrendous, cruel thing to do to a dog on purpose - especially a dog that already appears to be hungry. The message behind the piece is a good one: it was supposed to highlight the fact that people could get so incensed by a starving dog in an art gallery, but minutes later they could completely disregard a starving dog that they might pass on the street. The message is important, but the way in which the artist carried it out is just heart-wrenching - and you don't have to be an animal lover to agree. Naturally, this piece became hugely controversial because it involved an animal's wellbeing. The gallery claimed that the dog was being fed, but the principle remains. Any person with half a heart in them would find this appaling. Just because it's in a gallery doesn't mean it's art!